ATTENTION OUR NEIGHBORS IN HELOTES, GREY FOREST, LEON SPRINGS, THE DOMINION, FAIR OAKS RANCH & BULVERDE! HIGH WINDS & HAIL HIT OUR AREA ON 4/13/19. CALL PREMIER ROOFING FOR A FREE ROOF INSPECTION & DIGITAL ANALYSIS OF YOUR ROOF BEFORE FILING A CLAIM! 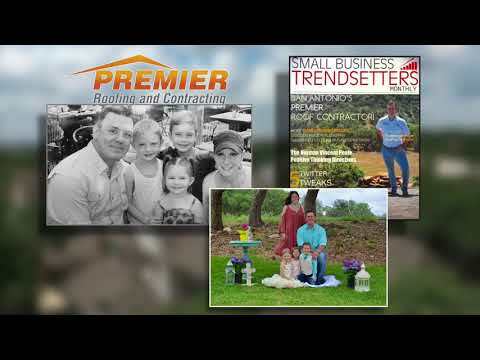 With over 8 years of experience, working passionately in the in the San Antonio area, Thaddaeus Biediger established Premier Roofing and Contracting to serve the community better than ever before. To learn more of Thaddaeus's competence and success within the industry, click here to view the complete article that 'Small Business Trendsetters' commissioned, realizing this is an Entrepreneur and Contractor you should know. Premier Roofing and Contracting is an independent contractor and is not an affiliate of Owens Corning Roofing and Asphalt, LLC or its affiliated companies. THE PINK PANTHER™ & © 1964-2019 Metro-Goldwyn-Mayer Studios Inc. All Rights Reserved.